Our hope is that this project will spread to all parts of the world and engage more schools, pupils, children, individuals, organizations, countries for each day and year. Express yourself with peace messages in any form you want; pictures, films, photos, drawings, dance or theatre plays and send it to us and/or post it on our Facebook page! On the 24 Octobe at 12.00 CEST on http://www.unday.org on internet and via SAQ transmitter at the World Heritage Radio Station Grimeton. Would your school like to be involved in the project “www.unday.org”? A project where students together with artists in the visual, sound and movement develop the school’s work on human rights and environmental sustainability. The project is open to all students, teachers and artists. We love to have contact with other parts of the world. Through cooperation with World Heritage sites in different countries, both contemporary and historical perspectives of cultural heritage, and togetherness between people and nations are communicated. Since 2011 regional theatre Teater Halland and the World Heritage Grimeton Radio Station has manifested UN day with a global live event broadcasted over the Internet with school children as main actors. They create the contenct and makes different forms of peace manifestations. Every year it is childrens rights and thoughts concerning a sustainable future that is in focus. At first sight it might be an odd collaboration by cultural institutions – a theater and a radio station… but there are at least two common factors! Both use communication and both have a pedagogical mission in society. UNESCO, United nations organization for international collaboration concerning education, science and culture, sees the World Heritage Grimeton Radio Station as a remarkable example of human ability to create the first wireless communication between two continents of the world. The world heritage, which uses radio technique developed during the first world war! Every year children prepares peace messages to be sent from Grimeton, a UNESCO symbol of world wide communication! Within the world of theatres new ways of communication is always searched for. Besides the traditional stage language, verbal as well as non-verbal, the modern technique opens to new ways of expression. With support and inspiration from the pedagogs at the theatre school children gets help in expressing themselves about peace and future also in digital forms. The learn to create music that can be combined with non-verbal expressions and they can learn to produce it with animations. Through the challenge to create non-verbal messages this UNday.org project seeks to bridge language barriers! The messages is presented ”live” through this world wide live broadcast over the Internet! We know, that last years broadcast was received and watched by schools in 73 countries! An important part of this project is that pupils and schools possess a better technique now than when the first men landed on the moon in 1969! Through the digital technique the children have got the tools to reach the whole world! 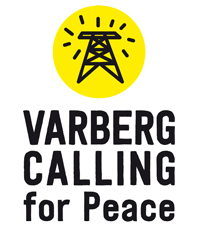 The project Unday.org focus om global thinking and the use of modern IT for peace, futural and sustainability purposes. It is possible to everyone to formulte and send peace messages world wide! To the leaders and policy makers of the world, to municipality representatives, to idols and even students in other parts of the world! 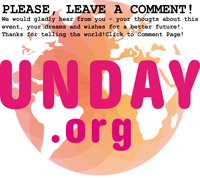 Join UNday.org and contribute to a more peaceful world through thinking, formulation and communicatin globally.One aim for this project is of course that it will be an ongoing project that engage more and more schools, organizations and other people for each day and year.